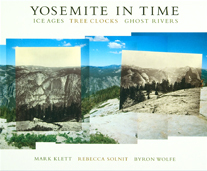 Ice Ages, Tree Clocks, Ghost Rivers. Photographs by Mark Klett and Byron Wolfe. Text by Rebecca Solnit. Trinity University Press, San Antonio, 2005. 144 pp., 60 duotone and color illustrations, 12x9¾". ZC561-LTD Limited Edition is no longer available.